Dr. Bernard M. Kubak is involved with the management of infections in solid-organ transplants and immunocompromised patients. Dr. Kubak is trained in Infectious Diseases and Microbiology. 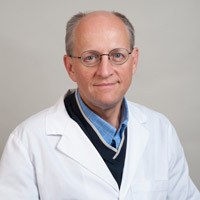 He received his Ph.D. training at Loyola University School of Medicine and performed post-doctoral research in immunology at Rush-Presbyterian St. Luke’s Medical Center; he received his medical education at Rush Medical College and post-graduate medical training at the University of California Los Angeles. Since 1993, he has been the formal representative to the UCLA heart and lung transplant program and the cardiac assist-device program. He directs the activities and training of staff in transplant infectious diseases. He serves on the executive committees for transplant infectious diseases at the American Society of Transplantation (AST) & the International Society for Heart & Lung Transplantation (ISHLT). With the AST, he authored the guidelines on the prophylaxis & treatment of fungal infections and he continues to work with the society’s Community of Practice for infectious diseases topics in donor and recipient infections. Further, he participates in graduate medical educational activities with the AST, the ISHLT, & the American College of Physicians on the identification of high-risk patients for infections in solid organ transplants & ventricular assist devices, antimicrobial agents, and emerging pathogens. He completed chapters for the state-of-the-art review of clinical & investigative aspects of lung transplantation (2006) and is a continuing medical educator with other medical centers around the country on the management of infections in immmunocompromised patients. He is listed in the Guide to Top Physicians in California (Infectious Diseases) for several years. He is a reviewer for several journals, has been principal investigator on trials in sepsis treatments, antifungal prophylaxis, and antiviral agents, and, also, is working with Drs. O. Yang and A. Gregson in transplant related research. He serves on the selection committees for heart and lung transplant, the epidemiology committee, and the bioterrorism task force, and he is the director for the David Geffen School of Medicine Infectious Disease elective. Extended donor use in heart and lung transplantation. Infections in lung and heart transplant recipients, ventricular assist devices and artificial hearts. Infections associated with extended-spectrum beta-lactamase producing bacteria, hepatitis C virus, endobronchial stents, Aspergillus & Coccidioides), & Influenza & respiratory viral infections in solid organ transplants. Kubak BM. Coccidioidomycosis in Heart and Lung Transplant Recipients. In: Lynch JP and Ross DJ, eds. Lung and Heart-Lung Transplantation. New York, NY: Taylor & Francis Group, 2006. Saggar R, Kubak BM, Ross DJ, Lynch JP. Mycobacterial Infections Complicating Organ Transplantation. In: Lynch JP and Ross DJ, eds. Lung and Heart-Lung Transplantation. New York, NY: Taylor & Francis Group, 2006. Patel JK, Parikh A, Kubak BM, Patel JP, Laks H, Kobashigawa JA. Poor Outcome After Heart Transplantation with Hepatitis C Donor Hearts and Non-Induction Immunosupressive Regimens. World Transplant Congress 2006. American Society of Transplantation, Boston, MA. Abstract #937. Patel SY, Ding L, Brown MR, Lantz L, Gay T, Cohen S, Martyak LA, Kubak B, Holland SM. Anti-IFN-gamma autoantibodies in disseminated nontuberculous mycobacterial infections. J Immunol. 2005 Oct 1;175(7):4769-76. Kubak BM, section author. American Society of Transplantation: Community Practice Guidelines. Amer J. Transplant, 2004 Nov 4(suppl 10). www.a-s-t.org. Part I: Fungal Infections. Part II: Treatment of Fungal Infections. Kubak BM, Maree C, Pegues D, Hwang A. Infections in Renal Transplant Recipients. In: Danovitch G, ed. Handbook of Kidney Transplantation, 4th edition. Philadelphia, PA: Lippincott Williams & Wilkins, 2004. Winthrop KL, Kubak BM, Pegues DA, Hufana C, Costamagna P, Desmond E, Sanders C, Shen P, Flores-Ibarra L, Osborne E, Bruckner D, Flood J. Transmission of mycobacterium tuberculosis via lung transplantation. Am J Transplant. 2004 Sep;4(9):1529-33. Ross DJ, Cole AM, Yoshioka D, Albert K, Park AK, John A. Belperio JA, Laks H, Strieter RM, Lynch JP, Kubak BM, Ardehali A, Ganz T. Increased bronchoalveolar lavage human beta-defensin type 2 in bronchiolitis obliterans syndrome after lung transplantation. Transplantation. 2004 Oct 27;78(8):1222-4. Umeh OC, Kubak BM, Pegues DA, Leibowitz MR, Froch L. Corynebacterium jeikeium sepsis after 8-methoxypsolaren photopheresis for cutaneous T-cell lymphoma. Diagn Microbiol Infect Dis. 2004 Sep;50(1):71-2.